Last week, my family and I got the chance to try Max's Chicken with their three new dips - gravy, chili and Pinoy sarsa. 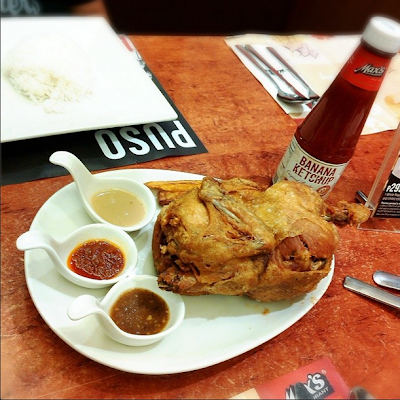 I have always loved their fried chicken enjoyed it with their famous banana ketchup. I know other people who enjoy it with the ketchup, hot sauce and the Worcestershire sauce mixed together. This time, Max's fried chicken can be enjoyed with other dips, chili being my favorite. Aside from this, Max's recently launched the "Gilas Favorite Delivery Treat," an offering of one whole Max's sarap to the bones fried chicken with a free bottle of banana catsup and a limited edition Gilas Pilipinas Eco Bag for only PhP299. This promo is valid until July 31, 2014 for both online and delivery transactions anywhere in the Philippines. 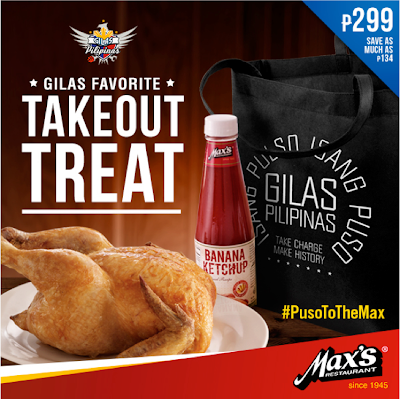 Coinciding with Max's Gilas Favorite Delivery Treat, Max's announced the winner for its "Dito Galing and Gilas" campaign. All set to fly for Spain are winners Pauline Vislenio and Jennifer Tayag Dueñes who will both be given a once-in-a-lifetime chance to watch Gilas Pilipinas compete live against the world's best basketball teams in the world. I haven't tried these new Max's dips yet, but I'm sure I'll enjoy chili, too.